India's merchandise exports registered double-digit growth in February for the first time since the Narendra Modi government took office, on the back of a 47% rise in engineering goods and improved international demand. Exports swelled by 17.48% in February to $24.5 billion but a steeper increase in imports at 21% widened the trade deficit to $8.8 billion -from $6.5 billion in the year-ago period. 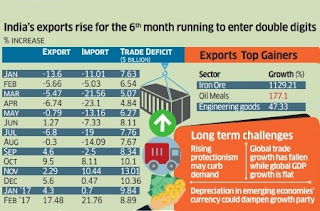 This is the sixth consecutive month of an increase in exports this year but double digits were last seen in June 2014. 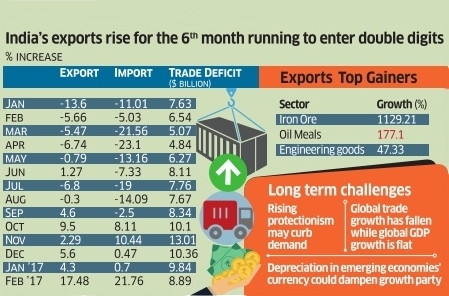 The month saw 23 of 30 exporting sectors, led by iron ore, registering more exports. However, a 147% spike in gold imports pushed total imports to $33.3 billion. Exports of gems and jewellery are expected to be higher in the next few months. The pace of growth in non-oil, non-gold imports firmed up to 5%, from 4% in the previous month, indicating strengthening domestic demand. Oil imports saw a 60% spike to $7.6 billion while non-oil imports were up 13.6% at $25.7 billion. 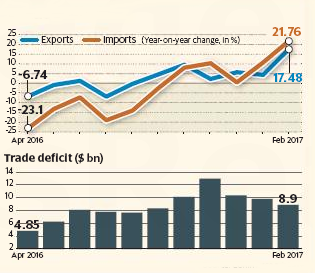 India's robust export numbers have come in a month when Chinese exports fell 1.3% and it reported a rare trade deficit. US President Donald Trump's `America First' policies have clouded the outlook for global trade. India exported $245.4 billion of goods in the first 11 months of 2016-17, up 2.5% from a year ago, while imports declined 3.7% in the same period to $340.7 billion, leaving a deficit of $95.3 billion. Revival in growth of services exports in January had been outweighed by an even faster expansion in services imports, as a result of which, the surplus shrank for the ninth month in a row, by 10% year-on-year.